Product images are for reference only. For complete build list, refer to description and specifications. 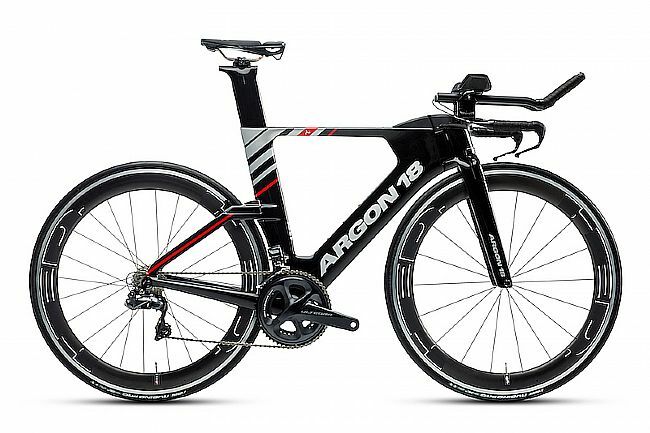 Argon18's 2019 E-119 Ultegra Di2 Triathlon Bike features tri-specific and size-specific geometry, a lightweight and aero carbon fiber frame, fork, and seatpost, and a proprietary rear brake with a cam-pulled system that's installed horizontally - both aerodynamic and easy to access and adjust. Frame: Carbon fiber E-119 Tri. Fork: Carbon fiber E-119 Tri. Shifters: Dura Ace Di2 SW-R9160. Front Derailleur: Ultegra Di2 R8050. Rear Derailleur: Ultegra Di2 R8050. Bottom Bracket: Press Fit SM-BB72-41B. Wheelset: HED Jet Plus 6. Tires: Vittoria Rubino Pro Speed 700x25. Manufacturer Warranty: 3-5 years for frameset, 1 year for paint, finish, and components.